My father's name was Thomas Browne. And his father's name was Thomas Browne. That's why my name is Thomas Browne. I didn't know until I was a college senior that there was a far more illustrious Thomas Browne, who had lived in England in the seventeenth century. Sir Thomas Browne was a gifted author, a student of the natural world, a scientist, a scholar, and an outspoken supporter of tolerance at a time when intolerance was the norm. In short, I couldn't have asked for a better namesake. We carry within us the wonders we seek around us. The beauty and power of that line stopped me cold, for some reason. Maybe it was exactly what I needed to hear at that particular moment in my life, a time when I was racked with indecision about whether the career I had chosen for myself—teaching—was full of enough "wonder" to keep me happy. I wrote the line down on a little slip of paper and taped it onto my wall, where it remained until I graduated. I took it with me to graduate school. I traveled with the Peace Corps and carried it in my wallet. My wife had it laminated and framed for me when we got married, and it now hangs in the foyer of our apartment in the Bronx. It was the first of many precepts in my life, which I began collecting in a scrapbook. Lines from books I've read. Fortune cookies. Hallmark card homilies. I even wrote down the Nike ad line "Just do it!" because I thought it was the perfect directive for me. You can draw inspiration from anywhere, after all. I first introduced precepts to my students as a student teacher. I was having a hard time getting my kids interested in the essay-writing unit—I believe I had asked them to write one hundred words on something that meant a lot to them—so I brought in the laminated Thomas Browne quote to show them something that meant a lot to me. Well, it turned out they were much more interested in exploring the meaning of the quote itself than they were in its impact on me, so I asked them to write about that instead. I was amazed at the things they came up with! Ever since then, I've used precepts in my classroom. According to Merriam-Webster, a precept is "a command or principle intended especially as a general rule of action." For my students, I've always defined it in simpler terms: precepts are "words to live by." Easy. At the beginning of every month, I write a new precept on the board, they copy it, and then we discuss it. At the end of the month, they write an essay about the precept. Then at the end of the year, I give out my home address and ask the kids to send me a postcard over the summer with a new precept of their own, which could be a quote from a famous person or a precept they've made up. The first year I did this, I remember wondering if I'd get a single precept. I was floored when, by the end of summer, every single student in each of my classes had sent one in! You can imagine my further astonishment when, the following summer, the same thing happened again. Only this time, it wasn't only from my current class that I received postcards. I also got a handful from the previous year's class! 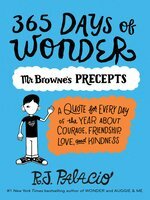 avdreader - I like this book because of all the great message it gives in all it's precepts. 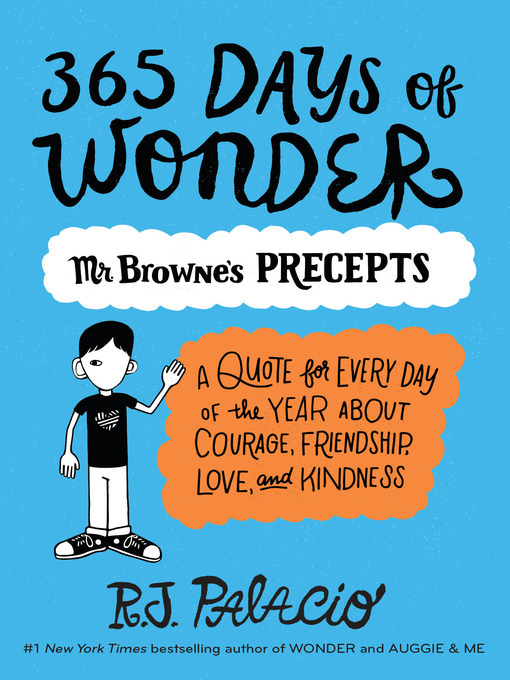 R.J. Palacio did another great job on this book. I love all books by her. I also like how she added some story in this book instead of just precepts. Nicholas Sparks, #1 New York Timesbestselling author "Wonder is essentially ... a wonder. It's well-written, engaging, and so much fun to read that the pages almost turn themselves. More than that, Wonder touches the heart in the most life-affirming, unexpected ways, delivering in August Pullman a character whom readers will remember forever. Do yourself a favor and read this book – your life will be better for it." Rebecca Stead, Newbery award-winning author of When You Reach Me "Full of heart, full of truth, Wonder is a book about seeing the beauty that's all around us. I dare you not to fall in love with Auggie Pullman." Christopher Paul Curtis, Newbery award-winning author of Bud, Not Buddy "It is the deceptive simplicity and honesty of the work that make Wonder so memorable. Every single character seems real and well drawn and oh-so human...This book is beautiful." Clare Vanderpool, Newbery award-winning author of Moon Over Manifest "A beautiful story of kindness and courage. There are many real and well-developed characters, and they each have their shining moments. Of course, Auggie shines the brightest." Patricia Reilly Giff, two-time Newbery honor-winning author of Lily's Crossing and Pictures of Hollis Woods "Wonder is a beautifully told story about heartache, love, and the value of human life. One comes away from it wanting to be a better person."